FOREIGN INVASIVE PLANTS are plants--often imported for agricultural, horticultural, or ornamental purposes--that have escaped cultivation and become so naturalized that they out-compete, stunt, and sometimes eliminate native species. Invasives may be aquatic or terrestrial and include herbaceous plants, vines, shrubs, and trees--any of which may have potential to significantly alter the floral/faunal make-up of a given area. 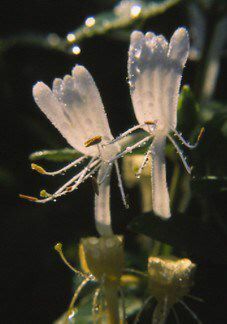 After 1982, when natural succession was allowed to proceed at Hilton Pond Center for Piedmont Natural History, among the first plants to appear were foreign invasives. Initially the most problematic was Japanese Honeysuckle (Lonicera japonica), which started as a ground-hugging vine that soon ascended into tree saplings as they grew. Several shrubs also established quickly, including Japanese Privet (Ligustrum japonicum), Russian Olive (Eleagnus angustifolia), and Multiflora Rose (Rosa multiflora). Despite their shortcomings, these plants at first played an initial role in bringing back the land from barren field to thicket. For the first 15 years, foreign invasives essentially were left to battle it out with native plants, with only Japanese Honeysuckle being removed systematically. In 1997, a policy was established to systematically eradicate foreign invasive plants from the property, especially shrubs such as privet, Russian Olive, and Multiflora Rose. Mechanical removal (cutting) of these species has eliminated most thickety areas but has allowed for increased growth by native trees, shrubs, and herbaceous plants. Accompanying subpages will contain photos of foreign invasive plants at Hilton Pond Center, as well as additional information about controlling them.